These pages showcase the work of Prof. Still, over the last 29 years across, a wide range of research and client projects. 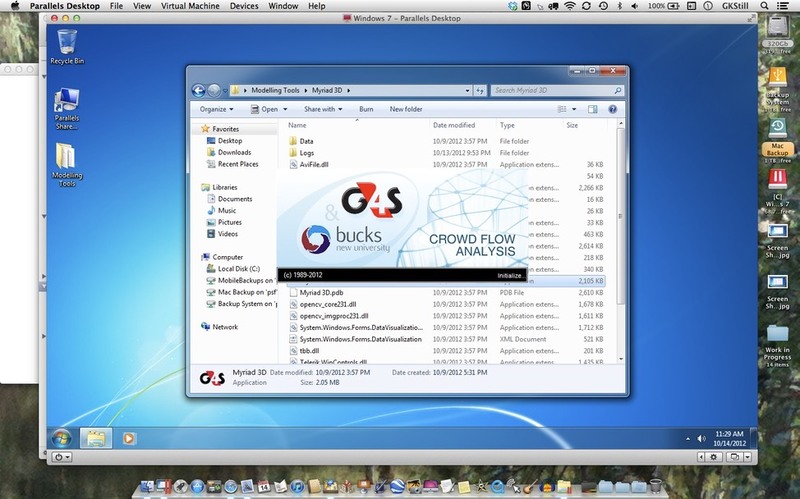 Above and Below -�image of the Windows 7 modelling tools running under Parallels on my Macbook Pro. This tool allows the user to import and site map/plan/image and position crowds. It calculates rates of fill,�visualises crowds at various�densities and produces 3D images of crowds in situ. This is a planning and�control room tool allowing operators to visuals the�crowds from any angle. I've used this on major projects including planning the Royal Wedding. Click on the link above for more details. 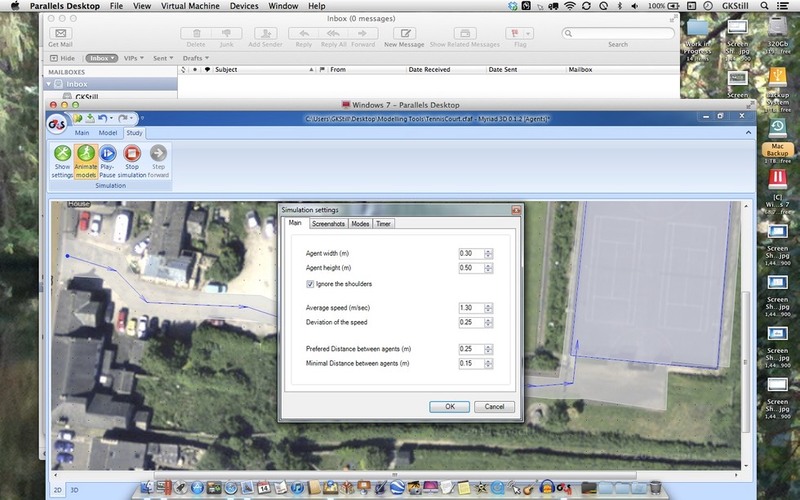 This tool allows the user to analysis the�utilised spaces in complex�environment. We developed and used this tool on the Jamarat Bridge project for both value engineering and risk analysis. Over the last few years the�algorithms have been replaced and enhanced using a new mathematical principle. Click on the link above for more details. This tool allows the user to define ingress, circulation and egress points in a system, connecting them to areas and obtain timing from flow rates, to predict fill times and times to reach critical density (fail times). The output is a site wide analysis for complex spaces. Following a series of field studies (click here for videos) the flow algorithms have been rewritten. The old two step nonlinear algorithm had a limit for multi-cultural�demographics - the new algorithm is more robust for a wider range of crowd compositions. This tool is the modelling system for complex�behaviours and allows the user the ability to experiment with a wide range of�options�relating to crowd reactions. The latest modelling tools have a new algorithm for their crowd behaviour heuristics and movement code, replacing the older grid/shadow based version. Outline�of using the agent based simulation system to assess the dwell times for trains/platforms. The was developed for a number of train�operating companies to assess dwell times under a�wide range of normal and high density situations. We worked with Alstom, Bombardier, Interfleet, Porterbrook and a number of�design teams evaluating platforms/stations. Analysis of progressive crowd collapse in static (front of stage) and dynamic (moving) crowds. Using this tool we can asses the risk of crowd�collapse in complex spaces, assessing risk for different types of crowd behaviour in built and complex environments. Experiments to determine concentrated forces on guardrails due to leaning and pushing have shown that force of 30% to 75% of participant weight can occur. In a US National Bureau of Standards study of guardrails, three persons exerted a leaning force of 792 N (178 lbs.) and 609 N (137 lbs.) pushing. In a similar Australian Building Technology Centre study, three persons in a combined leaning an pushing posture developed a force of 1370 N (306 lbs.). This study showed that under a simulated "panic", 5 persons were capable of developing a force of 3430 N (766 lbs. ).